The following is culled from comments I made on a Facebook thread in a private group in which it was being alleged that most Orthodox Christians aren’t meant to function as missionaries. The argument was mentioned that the Lord’s command to go into all the earth and preach the Gospel was given only (or mainly) to the apostles. Allowance was made for certain rare people who have a special calling, saying that “you can’t give what you don’t have.” It was also suggested that hermits may be the proper exemplars of Orthodox mission. These are my (somewhat edited) responses. Yes, it’s something of a rant, but my purpose here is to call out an argument, not any particular person. Forgive my frankness, but any argument that basically means that the Church (or even most of it) is done with mission is, frankly, cowardly garbage. It’s one that’s been made for a long time, of course, but “Am I my brother’s keeper?” is not the argument of someone we should be imitating. We are our brothers’ keepers. I can’t stand it when apostolic is reduced to a badge of authenticity rather than seen for what it is — a command to go forth. Good news is news — that means going and talking, not simply waiting around for people to show up. Any method of Church life that basically encourages people to treat the Gospel as a private possession is fundamentally treasonous to the Kingdom. Yes, I am indeed kind of mad about the fact that we don’t imitate our own saints very much in this regard. It may be that not all of us are called to be apostles, but we are indeed all called to be apostolic — or we are not in the Church. We may just as easily say that not all of us are called to be one or holy or catholic — which is of course nonsense. Why is it that of the many commands Jesus gave to His apostles, it is this one alone — the very last one — that is so often singled out as “just for the apostles,” when there is of course no indication from the text that this particular command was supposed to be exclusive to them? And do we have one Father saying that this command was exclusive to them? One? We are all sent — any kind of “mission” that doesn’t involve being sent isn’t mission at all. That is what the word means. And so does “apostolic,” by the way. We are sent. 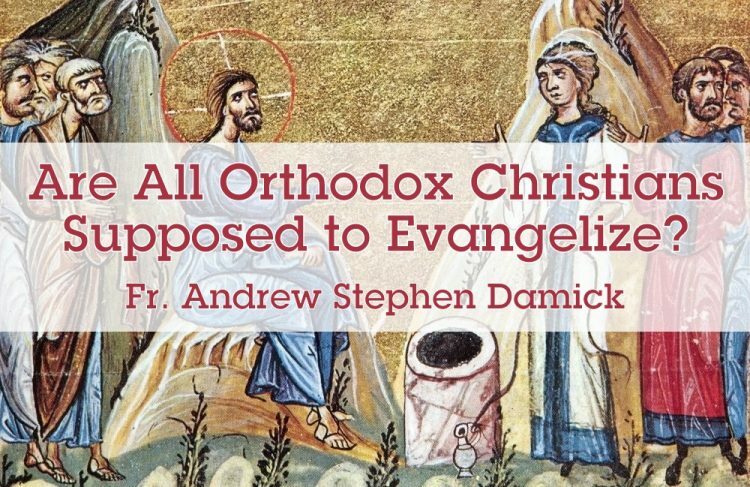 Evangelism isn’t reducible to knocking on doors or being active in Orthodox media, etc. The point is that we are all sent. None of us is not sent. We are the Church — the apostolic Church, the Church with a mission, the Church whose purpose is to encompass all of mankind in the love of the Trinity. As Abp. 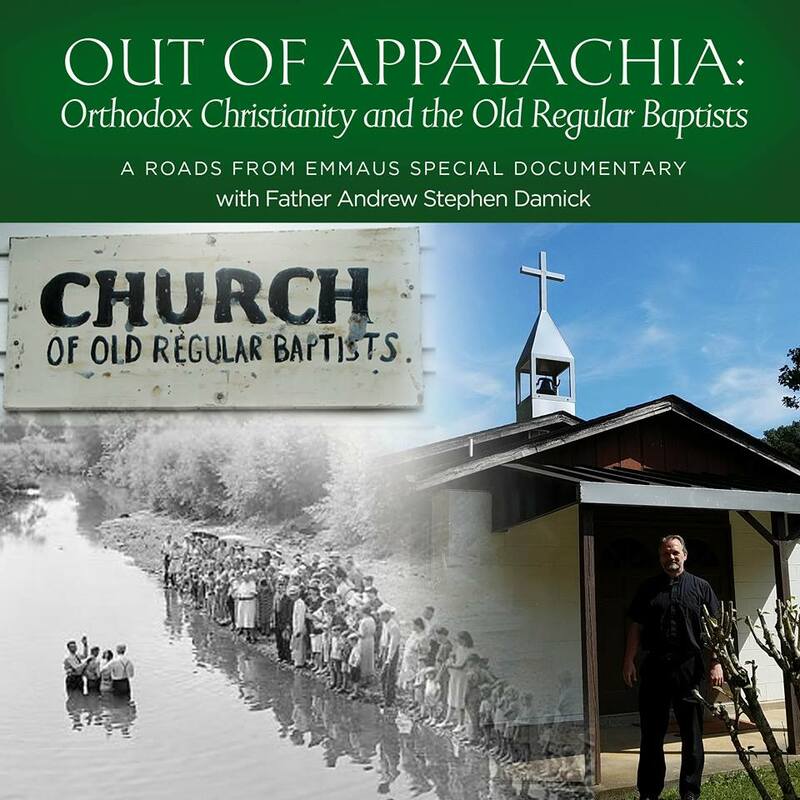 Anastasios of Albania has famously said, just as it would be unthinkable to have a Church without liturgical services, it is equally unthinkable to have a Church without mission. The “great holiness magnet” theory (just work on your own salvation and wait and see if someone happens to notice) sounds great on paper not because it is the teaching or practice of the saints but because we are cowards and don’t actually care about the salvation of others. Any mission strategy that precludes the actions of Jesus and the apostles themselves is no missionary strategy at all. Christians aren’t passive gurus who draw flocks of disciples to themselves by virtue of their reputations. (Indeed, the saints flee from such reputation.) They are precisely missionaries. Do we have hermits? Of course. But they are the extreme rarity, even among monastics. It makes zero sense to hold them up as the paradigm of evangelism. Why not the apostles? Really — why not the apostles? The Church is built upon them as the foundation, not on the hermits. It is said that you can’t give what you don’t have. Fair enough. But what do you have? You are a baptized Orthodox Christian, a bearer of the royal priesthood of Jesus Christ, an apostolic member of the Body of Christ. You already have that. You do not have to be ordained to holy orders. You are already equipped for mission work. You don’t have to be some advanced ascetic to engage in it. Did the Samaritan Woman have to have some special calling and advanced ascetical achievement before she went back home and told them about the Messiah? No. Did Philip for telling Nathanael? Did Andrew for telling Peter? One could go on and on. Yes, get training if needed for a specific context. But don’t wait. The point is that we love because He first loved us. If you can’t give that to people, then you are saying that God hasn’t loved you. And that, of course, is nonsense. You cannot give what you don’t have — okay. But you have Jesus Christ. If you’re not going to go give Him to people, you are saying that you don’t have Him. We are sent. We are not called to sit. We are sent. We should all be actively looking for ways to connect people to Jesus Christ. My anger at this issue is at the Church-hamstringing argument that would turn us into quietists and cloaks that in the false mantle of piety and humility. It is not pious or humble to neglect the perishing. It is cowardly. If you don’t have a missionary spirit, it’s because you don’t care that people are dying in their sins. You’re literally willing to let that happen and not do anything about it. So, yes, that angers me. Why? Because it’s a betrayal of what the Church is in her very essence. We may not all be called to be sent across the planet or out on the lecture circuit, etc. But we are indeed all sent. We have to be actively looking for ways to bring Jesus to people, not just wait for them to come asking. Yes, we’re all imperfect. Of course we’re imperfect. It’s one thing to realize that one is not doing one’s job as a missionary, but it’s another to deny the job altogether. The Church’s foundation is the apostles and prophets. If we’re not apostolic and prophetic, we may want to check if we’re not actually in the Church. Now that this post has been aired out for a few days, I want to address some of the disagreements and misunderstandings (and frankly, misreadings) that I’ve seen in response. First, I am in no way denigrating monasticism, including its eremetical type. I am very much in favor of monasticism. I take an annual retreat at a monastery every year, and I visit monasteries multiple times throughout the year. I have directed friends toward monasticism (including one who has been happily a monk for a good many years now) and rejoiced when I learned friends made it there on their own. All three of my sons have saints in their names who were monastics and even hermits. I pray for the proliferation of monasteries in the United States and elsewhere. I support them with my words, my time and my money. Let me be emphatic: I am very pro-monasticism. I also believe profoundly in the evangelistic value of monastics, including hermits — not just for their prayers but also in the many cases of such people “going” and “preaching” (two of the stipulations in the Great Commission). I can think of many sainted ones who did just that — Columba of Iona, Aidan of Lindisfarne, Cosmas of Aetolia, Raphael of Brooklyn, Cyril and Methodius, etc. The list goes on. Both “staying and praying” and “going and preaching” are effective evangelistic tools for monastics to be using. The problem comes when we hold up monastics as the paradigm for evangelism and especially when we focus on exactly the wrong things. What do I mean? One way is when we define them as the “real missionaries,” note that we are not monastics ourselves, and then conclude that missionary work has nothing to do with us. And of course holding them up as the real missionaries doesn’t seem to spur people into such ascetical ways of life, i.e., “Since missionaries are monks and since I am supposed to do evangelism, then I will go become a monk.” Is that happening? No, not very much. What about the famous dictum of St. Seraphim of Sarov? (“Acquire the Spirit of peace and thousands around you will be saved.”) Should we just sort of work on our own holiness and expect that that will do the trick? Of course, working on your holiness is right and proper and critical. (In fact, if you are a baptized, chrismated Orthodox Christian, you actually do have the Spirit of peace already! Of course evangelism will be more effective the more fully His presence is known in us.) But that is not the actual model that we see in Scripture or in the lives of the saints, i.e., just pray a lot, repent a lot, and wait for people to come to you. But what about as a precursor to more active evangelistic work? Of course we should not go off half-cocked. But we also shouldn’t be waiting around for some undefined moment when we’re holy “enough” to be missionaries. (How do you know when?) The Lord even sent the Apostles (both the Twelve and the Seventy) out before they had been fully initiated into the truth by Him. The point is that we should be giving what we have, even if it is a little. We should of course realize when we have only a little. But still give it. I had one priest tell me that his experience is that most Orthodox Christians are already doing that! I was amazed that his experience is so blessed. But that has not been my experience. My experience is that most Orthodox Christians are content to keep their Orthodox faith a private possession and experience — neither outreach nor “inreach” are their concern. They simply do not care. And for an excuse they may well cite these ideas about evangelism being only for certain people or times (yes, there are some who even claim that the whole world has already heard the Gospel, so that’s done). Finally, let me reiterate what I think evangelism actually is. It is not proselytism, where a message is imposed on other people, they are pressured to convert, etc. I don’t believe that evangelism should be obnoxious. I do not believe that it has to be door-to-door, on the street corners, etc. I don’t think those approaches are really even that effective, actually. As I said in the original body of the post, evangelism is actively to connect people to Christ, to find every way that they can be loved, that they can be told the message of Who Jesus is and what He came here to accomplish. I encourage creativity, variety, etc., according to the gifts of the person concerned — and introverts, extroverts and ambiverts are all welcome! There is no single method. So, I hope that clears some things up. Yes, we are to evangelize. Don’t listen to spiritually dead clergy who think otherwise.